Foot and ankle problems are common in nearly all sports. Most problems are generic and occur during play or athletic participation. Sports add intensity to normal activity and may bring out problems that might otherwise remain unnoticed. For example, a congenital tarsal coalition may remain silent only to become painful during adolescence. Some problems cause pain in adolescence and then subside in early adult life once activity is reduced. A girl may have anterior knee pain playing sports during her teens, but this resolves once she starts college and physical activity diminishes. Tight heel-cords may cause added stress on the tendon-bone interfaces around the calcaneus and cause pain in the 10-year-old soccer player. The two most common problems are detailed here. Heel pain is common during late childhood and adolescence and may occur at one of several levels. Pain may occur at the insertion of the Achilles tendon into the calcaneus. Irregular ossification of the calcaneal apophysis is often seen in asymptomatic children and is not a cause of pain. A stress fracture of the calcaneus is a rare cause of heel pain. 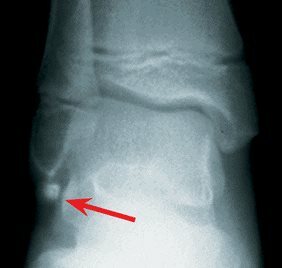 If the condition is at all unusual or unilateral, make a radiograph of the calcaneus to rule out other–problems. Manage most heel problems by elevating and padding the heel and modifying activities. Do the least that controls the pain. Unlike some other overuse problems, resolution occurs with time, and no disability follows. Start with modifying the activity if the family concurs. Next, recommend shoes with a slightly elevated heel and a cushioned sole. If necessary, add a foam wedge of compressed felt, 3/4 inch in maximum thickness, in the heel of a high-top shoe. Flexibility exercises of the triceps are useful in preventing recurrence. Most soccer shoes have little cushioning, which contributes to recurrence. They occur in classic locations. Most involve the lateral collateral ligament complex. Sprains are common in children and often involve avulsion of fragments of bone or cartilage. Sprains may become chronic and pose disability in adulthood. Sprains are usually classified into three grades. Evaluation Mild sprains damage only the anterior leaf of the lateral collateral ligament. Moderate sprains involve the middle (calcaneofibular ligament), and severe sprains damage the whole complex. Except for mild sprains with classic findings, order AP and lateral radiographs of the ankle to rule out other problems. Be aware that SH–1 epiphyseal injuries of the distal fibular (tenderness over mid-distal fibula), tears of the peroneal retinaculum (localized tenderness just behind the distal fibula), and tenderness inferior to the tip of the malleolus (os subfibulare),– may suggest a different diagnosis. Less common locations for sprains include the medial collateral ligaments (much stronger than laterals) and the calcaneocuboid ligaments. Management Ankle sprains are the most undertreated sports injury and have the highest rate of recurrence. In young children, undisplaced grade I fibular physeal fractures are more common than sprains. These sprains are usually managed as mild sprains because they produce no late instability. Manage sprains with RICE overnight and exercises to maintain muscle strength about the foot and ankle during convalescence. Mild sprains are those with minimal swelling and tenderness. The classic example is the anterior talofibular ligament with localized tenderness anterior to the distal fibula. Manage by rehabilitation to prevent recurrence. Sometimes an air-stirrup splint improves comfort. Moderate sprains have more swelling and a wider area of tenderness with little or no instability. Manage by resting the ankle with a plastic splint or a cast for 2–3 weeks. Allow return to activities once muscle strength is regained, tenderness resolved, and range of motion restored. Severe sprains produce severe swelling, and instability may be demonstrated. Management of ankle instability for sprains is controversial but repairs of chronic instability may be necessary. Most may be managed by cast immobilization for not more than 3 weeks. Return to sports Teach proprioceptive exercise to reduce the risk of recurrent injury. Delay return until the child is able to walk normally, run a straight line and change direction at full speed without discomfort.